The AVE MH-7 folding electric bike has long been one of the favourite electric bikes for both motor home and caravan owners. In addition, it has also proved extremely popular with ladies and gentlemen of all statures who want to have a bit more fun when getting from A to B. In the last year, the AVE MH-7 has gone through a number of face-lifts and modifications. 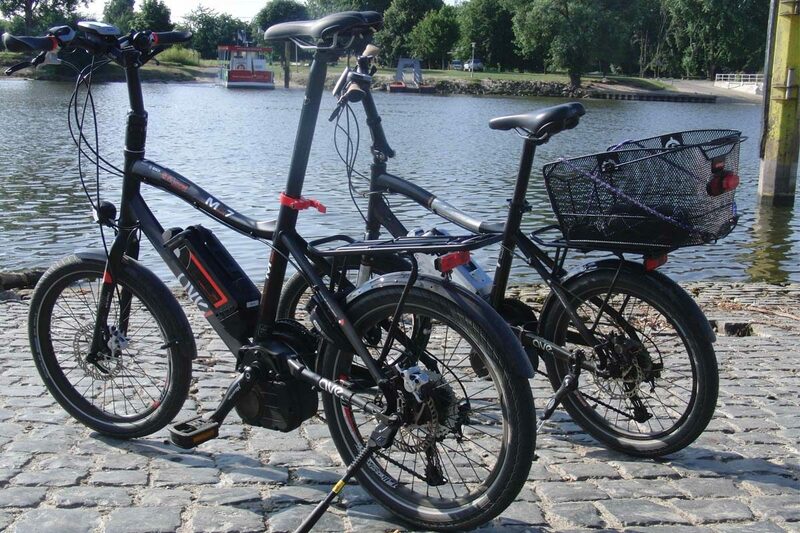 The image above shows the two models side by side, with the ebike in the foreground being the superior model of the two, with a far greater level of features and components. The MH7 comes from a winning pedigree of ebikes and won ExtraEnergy contest for the ‘Urban‘ category of electric bikes, and was awarded a ‘superb‘ rating by the magazine ElektroRad in February 2013. With 20″ wheels, the extremely nippy MH-7 is the ideal choice for hill-climbing and getting around the canal-sides, railway tracks and just about every type of terrain it encounters. The key fold on this folding electric bike is on the handlebar stem, a much improved self-locking A-head mechanism on its predecessor. More simple. Much easier. Less hassle. In addition, the new MH-7 has Busch & Mueller lights, front and rear, and comes in a beautiful matt black (volcano) and red finish. The Bosch motor is just as sweet as always, but the new Intuvia display makes a huge difference to the rider with its large and clear provision of all necessary information. A vast improvement on the previous HMI unit. Add to that Draco hydraulic brakes and you have a superb performer; reliable, agile, compact and stunning good looks too! The Schwalbe Big Apple tyres soften the bumpiest of terrain and further enhance the rider experience. Without a doubt, the MH-7 is ideal for away days, or for simply having fun! Raleigh Motus Crossbar Bikes Have Arrived……!